Caddis Chronicles: Is it March or Mid-April? Who Cares, We've Been Fishing. Is it March or Mid-April? Who Cares, We've Been Fishing. According to the calendar, it's March, but you wouldn't know it by the balmy weather and all the daffodils in bloom on the hillside behind the house. Today the temps reached into the low 70's. Our rivers are on the low side, and clear as gin, which is unusual for this time of the year as we typically have snow runoff and spring rains to muddy the waters and keep us guessing with respect to hatches. The hatches have been great this year so far, with daily hatches of both Little brown and black Stoneflies, Blue-winged Olives, midges, and even sightings of a few Quill Gordons here in NJ. On Saturday I had to be in Bethlehem, PA in the morning, so I made the most of it and brought my fishing gear. In the afternoon, I fished the Monacacy and Little Lehigh, both of which are fine little limestone spring creeks in the Lehigh Valley. Although the air was cool and breezy, the bugs and the fish didn't mind at all. I took a bunch of trout on both steams using only dry flies, mostly Matt's Gnats, sizes #20-22. I also landed a few that took small, size #18, Little black Stonefly imitations. It was a mixed bag of rainbows and browns, the largest being a 13-14 inch rainbow that took the Gnat. On Sunday, after teaching back-to-back fly tying classes at Shannon's Fly Shop in Califon, NJ, I hit the South Branch of the Raritan River for a couple of hours. There were lots of bugs on the water and in the air, and pretty much the same menu as I saw in the Lehigh Valley the day before. The only difference being the Olives I saw on Sunday varied between sizes #18 to #24; the Olives I saw on Saturday were pretty much size #20s. Here the trout wanted the stoneflies, and what was unusual was that they would only take them when I dead-drifted my offering. This was one of those "you never know" days, as even though the trout were chasing and taking the active stonefly adults, an active presentation didn't even get a refusal from the fish. But when I presented the fly dead-drift, they would nail it like it was getting away! I ended the day with a half dozen or so rainbows to net, all of them on my Little black stonefly imitation in a size 14. It's a simple pattern, tied using only three materials. 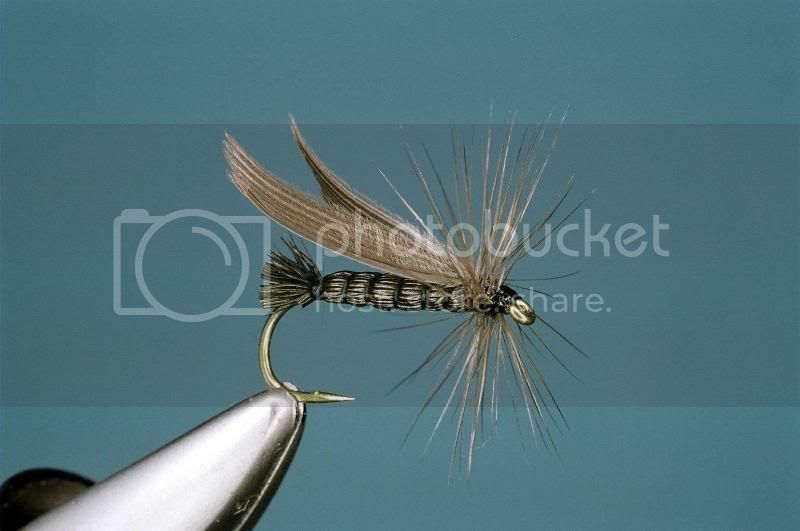 Substitute brown thread, deer hair and hackle for the little brown stonefly. This weather has been great!